It's this year's "Snakes on a Plane," the movie that's getting snickers for its mere title. But since this guy is writing it, it could be pretty funny. He reminisces about how the movie came to be, and it turns out that ties in big-time to growing up in the 1980s. Now keep in mind that I have no authority to remake anything. And a movie called Hot Tub doesn’t even exist. But that’s all beside the point. I’m ready to remake this! This bodes well. Matt tells me, “No, Hot Dog,” and I get a little bummed, because I remember when I was a little fat kid in the '80s and saw the title, Hot Dog, I really wanted the movie to be about hot dogs. I also got burned by Hamburger...The Motion Picture. But still, I saw where Matt was coming from. A ski comedy. But how to do it in a not-lame fashion? I didn’t want to write a spoof. I wanted to write a movie that would allow real characters to live within the reality that only exists at a 1980s ski resort. The other question was what decade to set it in. Writing a ski movie with '80s leads is invariably going to end up going down a schlocky road. But writing a ski movie set in the present day wouldn’t afford the same type of comedy without being inauthentic to the era. I was at a crossroads. If only there was a way to set it in both times. Some sort of time machine. A Hot Tub Time Machine." Oh, those 1980s ski schlock comedies, spoofed so well by "South Park" in the "DARSH!" episode. (That's not its real name, but that's how I remember it.) Also, I think Rob's best friend Todd was in Hamburger the Movie, and I always think he was in Hot Dog. Or maybe he was in Hot Dog, and I always think he was in Meatballs. Whatever. He was in some 1980s food-titled movie. My point, and I do have one was...I dunno. Ski comedies? 1980s schlock? 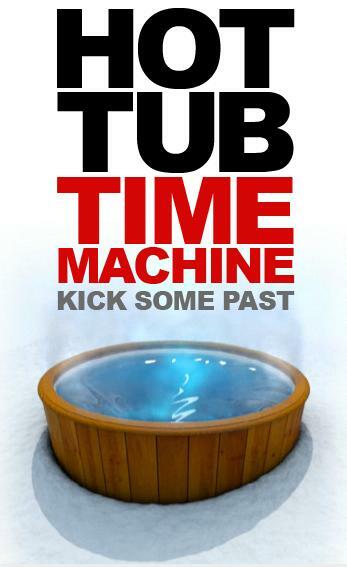 "Hot Tub Time Machine"? Discuss amongst yourselves!